Useful cause/effect writing and pre-writing activities can include brainstorming, outlining, vocabulary sorting, gap fill exercises and sentence writing activities with picture cues. Teaching cause/effect is pretty enjoyable as it can be applied easily to just about any topic including the environment, technology, social issues, social trends and behaviour. 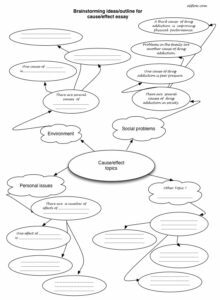 This is a cause-effect topic brainstorming worksheet for students writing cause effect essays. 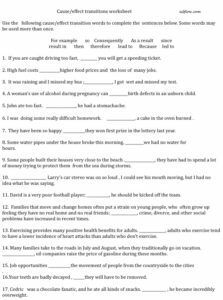 Students fill in the blank bubbles with suitable topics and sub-topics and think of causes or positive and negative effects related to these topics. 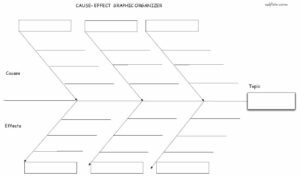 This is a cause-effect brainstorming and academic essay planning worksheet for students writing cause effect essays. Click on the image or the link to download the PDF file. This is a cause-effect brainstorming and academic essay outlining worksheet for students writing cause effect essays. 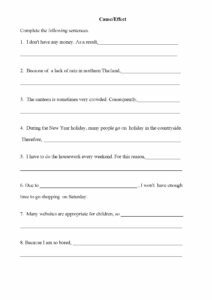 This worksheet is to help familiarize students with cause/effect transitions. Understanding and knowing how to use cause/effect transitions is essential for anyone who aims to be a good writer. 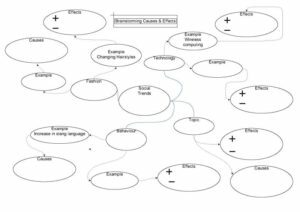 This is a transitions and linking words exercise for a cause/effect essay. Well placed transitions help make essays easier to read and understand. Students complete the sentences to demonstrate they understand the logic of cause and effect. In this cause/effect sentence writing worksheet students use the pictures to write appropriate cause/effect ideas. They decide whether they want write the causes or effects for each pictures and try to think of 3 causes or 3 effects. In this cause/effect worksheet students use the pictures to write their own ideas. They try and identify the social issues and think about causes, effects and solutions. In this cause/effect essay writing worksheet students use the pictures and their own ideas to write appropriate cause/effect sentences.